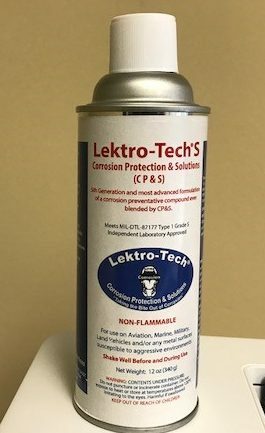 Lektro-Tech S is a solvent based product containing a lubricant and a variety of corrosion preventative compounds. It is hydrophobic that drives off all forms of moisture and blocks moisture from returning to the surface of the treated area. Protective film remains flexible-will not chip or crack. Lektro-Tech S will dry on contact to an anti-static and Hydrophobic film that will prevent electrical and mechanical assemblies from corrosion even if accidentally sprayed with Salt Water.